A significant number of Arab citizens are getting tired of hatred and violence. They would like to see their communities recovering from the disease of anti-Semitism. Some of them have a feeling that peace will be better attained in the Middle East and around the globe when the Arab world strengthens its commitment to its own wisdom tradition. Misled by propaganda, millions of Arabs today seem to support terrorist organizations and their varied actions of boycott against Israel. This is because they lack access to proper information and have no real freedom of thought. When they get a chance to open their eyes to the healing influence of the Universalist dimension in their culture, common sense will be possible whether they live in Gaza or New York. No one can delay the rising of the Sun in the morning or prevent a peaceful dialogue when people are ready for it. Once the time comes for different nations to awaken from spiritual ignorance, the lack of ethics will disappear. Theodor Herzl, the man who founded modern Zionism, had his reasons to predict that Arabs and Jews would live side by side as true friends. 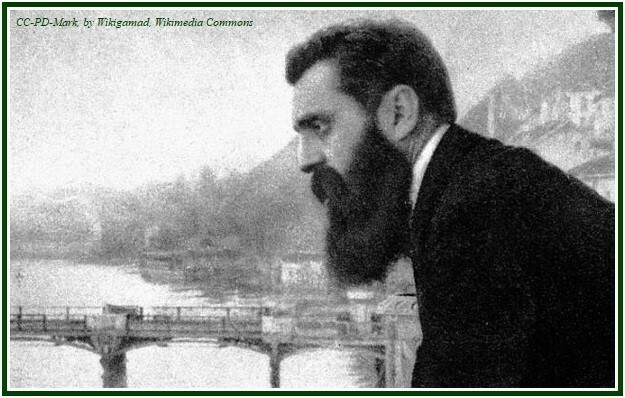 In his revealing 1902 novel “Altneuland”, Herzl described the cultural atmosphere of the Jewish State, whose creation he correctly foresaw and started preparing nearly half a century before the actual independence of Israel took place in 1948. As a historical project, the building of the country is still unfolding. The Jewish State has been following the broad lines established in Herzl’s vision. And he did not foresee a separation between Jews from Arabs. His One State Solution would emerge in harmony. All religions are already respected by the State of Israel. One can even say that the 2018 status quo regarding the Temple Mount is unfair toward the Jews. Interreligious coexistence will occur in complete harmony once blindness and prejudice are conquered in the souls of people. “As for human nature in general, it is the same now as it was a million of years ago: prejudice based upon selfishness; a general unwillingness to give up an established order of things (…)”. The Arab world has reasons to feel due gratitude for the Jewish tradition. Everyone must have respect for his elders and Judaism is one of the main sources of young Islam. In other words, study and contemplation are preferable to violence. The idea is familiar to those who search for wisdom. A universal view of life is present in Arab culture, as one finds in this fragment: “I am the child of Time, my tribe, mankind, and now this world is my caravanseri (Al-Ma’arri, Rihani)”. There is no reason to appease terrorist organizations by boycotting Israel. Peace results from justice and good discernment, not from ideological wishful-thinking. When Arab and Jewish wisdom-traditions are seen as branches of the universal knowledge belonging to all mankind, mutual help among nations will be accepted as something that is as natural as breathing. No one should be too afraid of thinking about the best and the highest. A rebirth of Arab wisdom in Israel can help bring about the end of a nightmare. As long as noble dreams guide one’s actions, the seeds of eternal wisdom are present, and justice and equilibrium tend to occur. These three initial quotations are from “The Book of Arabic Wisdom – Proverbs & Anecdotes”, compiled by Hussain M Al-Amily, NI, New Internationalist Publications, UK, 2003, 200 pp., see p. 25. Hussain M Al-Amily was born in 1927, in Irak. “The Book of Arabic Wisdom – Proverbs & Anecdotes”, compiled by Hussain M Al-Amily, page 24. “The Book of Arabic Wisdom – Proverbs & Anecdotes”, compiled by Hussain M Al-Amily, page 17. These two sentences are included at page 26 of “The Book of Arabic Wisdom – Proverbs & Anecdotes”. “The Book of Arabic Wisdom – Proverbs & Anecdotes”, page 17. “The Book of Arabic Wisdom – Proverbs & Anecdotes”, page 22. “The Book of Arabic Wisdom – Proverbs & Anecdotes”, same page 22. “Old New Land”, (“Altneuland”), Theodor Herzl, Markus Wiener Publishers, Princeton, third printing, 2000, book two, chapter two, page 66. “Old New Land”, Theodor Herzl, Markus Wiener Publishers, 2000, page 67. “The Mahatma Letters”, published by T. Fisher Unwin Ltd., in London, UK, with 493 pages and Index, see Letter I, p. 3. “The Mahatma Letters” is available in our websites. The number of pages is the same in the TUP edition. “Old New Land”, Theodor Herzl, Markus Wiener Publishers, 2000, Book One, Part V, page 41. “Letters from the Masters of the Wisdom – First Series”, edited by C. Jinarajadasa, TPH, India, 1948 edition, see “Additional Letters”, page Letter II to Laura C. Holloway, p. 204. The book is available in our associated websites. “The Wisdom of the Arabs”, compiled by Suheil Bushrui, Oneworld Publications, Oxford, England, 2002, 254 pp., see p. 221. “The Wisdom of the Arabs”, compiled by Suheil Bushrui, Oneworld Publications, page 220. See pages 38 and 106, respectively, in “Ethics from Sinai”, an eclectic, wide-ranging commentary by Irving M. Bunim, volume I, Philipp Feldheim, Inc., New York, 1964, 360 pages. The edition has 3 volumes. “As the Arabs Say…”, Arabic Quotations Recalled and Interpreted, by Isa Khalil Sabbagh, volume I, 1983, copyright Isa Khalil Sabbagh, produced by Ray Graham Associates, Inc., 84 pages, see p. 35. “The Wisdom of the Arabs”, compiled by Suheil Bushrui, Oneworld Publications, 254 pp., see p. 220. “The Wisdom of the Arabs”, compiled by Suheil Bushrui, Oneworld Publications, 254 pp., see p. 73. “As the Arabs Say…”, Isa Khalil Sabbagh, volume I, 1983, see pp. 10-11. “The Wisdom of the Arabs”, compiled by Suheil Bushrui, Oneworld Publications, 254 pp., see p. 94. “The Wisdom of the Arabs”, Oneworld Publications, 254 pp., see p. 184. As to revenge, see also Leviticus, 19: 18, whose tenet must be applied to all fellow humans. “The Key to Theosophy”, Helena P. Blavatsky, Theosophy Company, Los Angeles, see p. 20. “The Book of Arabic Wisdom – Proverbs & Anecdotes”, compiled by Hussain M Al-Amily, page 30. “The Book of Arabic Wisdom – Proverbs & Anecdotes”, compiled by Hussain M Al-Amily, page 23. “The Book of Arabic Wisdom – Proverbs & Anecdotes”, compiled by Hussain M Al-Amily, page 19. “The Wisdom of the Arabs”, Oneworld Publications, pp. 95-96. “Old New Land”, Theodor Herzl, Markus Wiener Publishers, 2000, Epilogue, page 296. The above text was published on 1 June 2018. It is also available at our blog in “The Times of Israel”. See the articles “Israel: Besides Defeating Terror” and “Israel, the Old New Land”.